California’s top winegrowers are used to taking the moral high ground when explaining the quality of their wines in low-tech terms such as gravity flow, minimal intervention, low yields and wild yeast fermentation. They don’t like to take a back seat to someone with a “holier than thou” attitude employing a technique they do not. Which is why they resist efforts within their own ranks to promote organic farming. There is hardly an issue in wine today that provokes more emotion, opinion and controversy than organic farming. Both sides are guilty of stereotyping the other: non-organic farmers view organic farming methods as riskier resulting in lower yields with the potential for significant crop loss. Certified organic growers—who use only naturally occurring products—believe non-organic growers over-fertilize, over-irrigate and are indifferent to the environmental effects of herbicides, fungicides and insecticides. The truth is there is a continuum of non-organic growers—at one extreme there is little that separates non-organic growers from organic growers. “I would say it is only very tiny issues that separate an organic from a non-organic farmer. Those who are latching onto it from a marketing perspective want to polarize the issue and make more of it that it really is. It’s not either/or. I think all good farmers are as organic as they can be,” says Dave Ramey, winemaker at Rudd Estate in Napa. Winemakers are becoming more and more organic whether they are certified or not in their wine production practices. 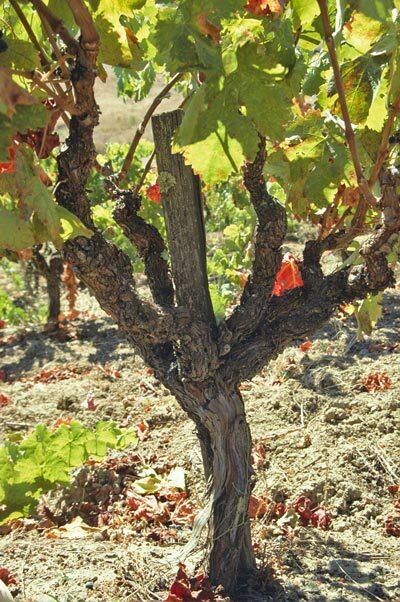 The debate is likely to intensify because more winemakers are planting experimental organic plots due to the merging of different trends: the realization that great wine is made in the vineyard and therefore the vineyard—especially the soil—must be treated as the winemaker’s primary asset. As never before, new vineyard plantings are encroaching on residential areas forcing growers to be more conscious of the societal and environmental effects of their farming practices. And finally—and most controversial of all- is the idea that to show terroir, the use of chemical fertilizers, herbicides and pesticides must be eliminated. All of this raises questions. How can successful growers and winemakers hold such divergent views on farming? Are organic farming practices the secret sauce to more flavorful wine or are they just better for the environment? And are all organic methods necessarily better for the environment? In an increasingly competitive wine market, are organic farmers creating buzz to sell wines? Do you need to eliminate the use of chemical fertilizers, herbicides and pesticides to show terroir? One practice that separates non-organic from organic growers is the use of Roundup. The controversy surrounding the use of this herbicide is symbolic of what are for the moment irreconcilable differences between the two camps. Roundup is a weed killer which is sprayed in the vine rows. By keeping the area clear of growth, burrowing animals and insects will not have direct access to the vine’s roots and foliage. The organic side—bolstered by their own research—believes that Roundup residues persist in the soil long after application, is toxic to beneficial soil microbes and earthworms, can leach into ground water and that the producer, Monsanto was indicted for falsifying data in getting Roundup registered. The non-organic side—citing their own research—believes Roundup is a benign chemical that rapidly bio-degrades, doesn’t get into ground water and cites research that Roundup has only temporary and therefore inconsequential effects on soil microbial life. Hampton Bynum of Davis Bynum Winery explains why maintaining bio-diversity—a multitude of soil microbial life as well as insect and plant life is an important tenet of organic farming, “We had an aversion to using herbicides, fungicides and insecticides since the beginning, based on the idea that you go in and start messing with the ecosystem, pretty soon you're going to be creating as many problems as you're solving.” An insecticide may eliminate a problem insect but if it inadvertently wipes out a beneficial insect that was feeding on another pest, you’re back to where you started. Organic growers claim that by maintaining bio-diversity, the vineyard is less vulnerable to attack by predators such as the blue green sharpshooter which transmits Pierce’s Disease. The more uniformly an area is planted to a single crop—let’s say grape vines—the more rapidly a disease or pest can spread. Conversely says the organic farmer, the greater the variety of resistant plants or other crops planted in and around the vineyard, the more slowly the disease or pest will spread. Bio-diversity is used a tool in organic farming which explains the use habitat ditches and insectary plants. Habitat ditches contain vegetative material that is more attractive to a leafhopper than a grape leaf. Insectary plants attract birds and insects that will in turn feed on leafhoppers. As Lemon alluded to, in order to protect their vines from mildew, organic farmers have to spray their vines more frequently than non-organic farmers who have an array of synthetic products available. Synthetic products are “systemic” meaning they enter the vine and provide more long-lasting protection. Organic sulfur has a very short life—when you make an application of a sulfur product today, everything that grows out afterwards is unprotected. The late Warren Dutton—criticized by some for his conservative farming practices and lauded by others as a highly successful grower—planted his first vines on the Sonoma Coast in 1965. Dutton tends 1,000 acres most of which is Chardonnay, he commented, “To me, there is a high risk of organic farming. To be certified organic is like driving around in a Model A—a huge amount of extra work and extra cost. You could do a program that is 90% organic and have a huge reduction in the amount of materials you are using.” His practices are not only a result of his attitudes about farming but also the grape variety he is growing—Chardonnay which is susceptible to mildew—and where he is growing it—on the Sonoma Coast Chardonnay where mildew pressure is high. The subject of terroir swamps all others these days: how accurately does a wine reflect the soil, climate, growing conditions of a vineyard. 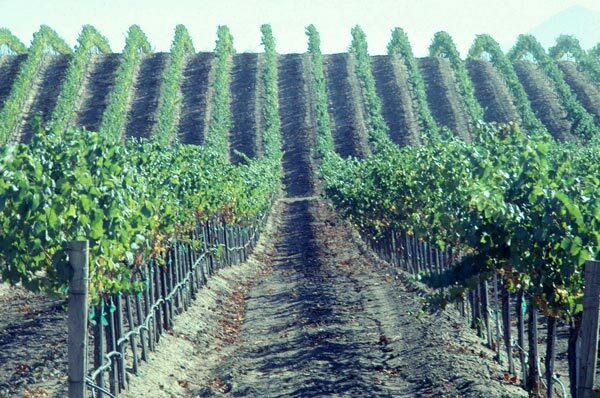 The majority of California Chardonnays for example, do not show terroir because there are so many winemaking factors that can mask terroir—oak, sur lees, battonage and malolactic. Ironically, it is these processing flavors which win blind tastings. Believers in terroir say that the wine may be good but it is not representative of the vineyard—it does not reflect the soil. What difference does that make; the wine scored 90 points and is sold out.